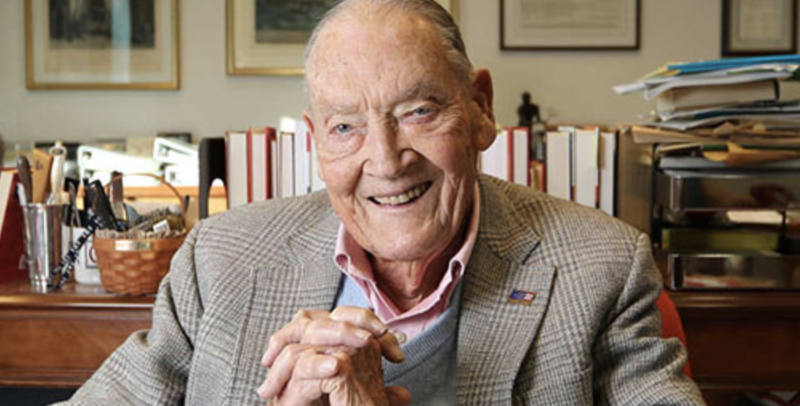 Vanguard founder Jack Bogle, a pioneer in the field of low cost passive investing and creator of the index fund, died Wednesday at the age of 89, marking the passing of one of the most widely respected financial minds of the 20th Century, according to a long obituary published in the Philadelphia Inquirer. Bogle, who founded Vanguard Group in 1974, an asset-management firm that eventually swelled to more than $5 trillion in assets with 16,600 employees. Bogle, who died with a relatively modest fortune of $80 million after spurning a public offering and instead turned ownership of his firm over to its clients, has been praised as "the last honorable man" in business. Bogle would often say that his greatest accomplishment was putting the "mutual" back in "mutual funds". He was best known for evangelizing the buy-and-hold investing mentality - a hallmark of the passive funds he developed. Bogle is survived by his wife, Eve Bogle, whom he married in 1956, children Jeanne Bogle England, Nancy Bogle St. John, Sandra Hipkins Bogle and John C. Bogle Jr., and at least 12 grandchildren. Bogle's biggest innovation - now conventional wisdom - is that, over time, funds tracking an index like the S&P 500 would outperform actively managed funds. Mr. Bogle had long argued that a mutual fund representing a broad range of businesses - for instance, the Standard & Poor’s 500, an index containing the stocks of 500 large publicly held U.S. companies - would not only match the market’s average return but also generally surpass the performance of actively managed funds. "You want to be average and then win by virtue of your costs," Mr. Bogle said. "Cost is a handicap on the horse. If the jockey carries a lot of extra pounds, it’s very tough for the horse to win the race." Bogle had a reputation as a "straight shooter" and "capitalist with a soul" who was fond of folksy sayings. He was fond of saying that “‘so-and-so is all hat and no cattle.’ Jack was all cattle and not very much hat." Even in to his 70s, he displayed the energy of men half his age despite a life long battle with heart disease, the result of a congenital heart defect that impacted his heart's electrical current. Though reports about his death didn't specify a cause, he had his first heart attack in 1960 at the age of 30. His heart stopped several times after that. When he was 37, his doctor advised him to retire. Instead, he switched doctors. He eventually outlived three pacemakers. In 1996, surgeons at Hahnemann University Hospital replaced his faulty heart with a new one following a more than four-month stay in the hospital. The new heart gave him a burst of energy that revived his spirits and ability to work. In 1999, Fortune named him one of the investment industry's four titans of the 20th Century.